It’s simply a search that yields listings within a certain distance of a specified point. It could be a home address, a hospital, shopping mall, park, or any physical location. It’s not the same as using Walk Score, and it can be a better way to provide listings close to locations when it’s a rural area or very small town center. You can build a Radius Search link to produce a search results page, and the screen shot shows how the information is entered. Entering an address and clicking on Lookup will yield the Latitude and Longitude. Then you specify a distance from that center point for listings to appear in the search results. You can also set other criteria like price range, features, etc. Why would a site visitor want to search for listings within a certain distance of a known location? Locate homes for sale near friends or family. Elderly wanting to live close to medical care. Desire to be near a certain town or location, but they want to see if lower prices can be found a bit farther out. Minimize commute time to work. Locate near a landmark, beach, lake, hiking trails, parks, etc. There will be other reasons, but you can be sure that radius searches are of value to your site visitors. In the Taos, NM vacation and resort market, the goal is to either buy a condo or vacation home in the ski area or in the town. They are 20 miles apart. Condos are less expensive in town with much lower management cost. 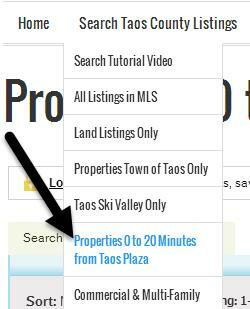 The broker created a custom search link for listings within 20 minutes of the town plaza. This is a popular search as shown by Google Analytics, and he has been complimented on it by site visitors. Consider creating some Radius Searches for your site based on proximity to major highways, businesses, employers, shopping, etc. Can you build a radius search with idxpressPro? What tool or widget is used to create the radius search? over dread as we face the exhilarating unknown.